Imbolc- also known as Imbolg, Candlemas, and the feast of St. Brigid- is the Gaelic Sabbat marking the beginning of spring. Imbolc is celebrated on February 2nd, when the earliest signs of spring are beginning to appear. Honoring the goddess Brighid- a maiden goddess corresponding to light, poetry, and the flame of wisdom- Imbolc has been celebrated throughout Ireland, Wales, Scotland and the Isle of Man since ancient times. 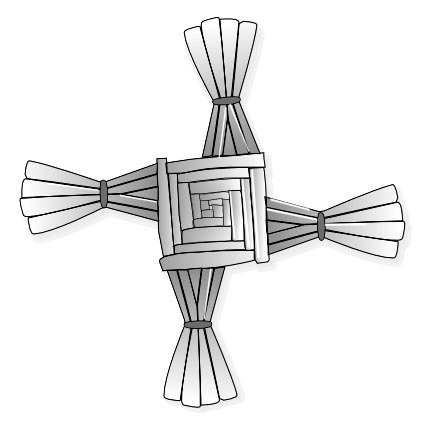 The symbol above, the Brigid’s cross, was made and displayed to bring the goddess’s blessings. In many ancient homes, Pagans would make up a bed and leave food and drink for the goddess Brighid, should she choose to visit their home. This Sabbat was also a time to visit sacred wells and practice divination, seeking the goddess’s wisdom and guidance. When Christians invaded the Gaelic nations, many Pagan traditions were borrowed and “Christianized”, including the goddess Brighid. Called “Saint Brigid”, Christian mythology maintained many aspects of the goddess’s lore, and continued to celebrate her feast day in place of the ancient Sabbat.